OMNIREF LTD, agent of Danfoss COOLING and HEATING segments in Greece and Cyprus, based on its long experience, expertise and market knowledge, provides Marketing, Sales and After-Sales support for products and solutions that cover a wide range of applications in the areas of Building, Industrial and Marine automation. Our aspiration is to become the vital link between the supplier and customers, creating value for both. In order to achieve our goals, we work closely with our partners with passion and trust. Danfoss is an international leader in research, development and production of mechanical and electronic components and solutions, offering products that cover a wide spectrum of applications from cooling and heating homes and offices, refrigerating food and control of production lines to industrial and marine automation. Danfoss innovative engineering dates back to 1933 and today the company holds market-leading positions, employing 27,000 and serving customers in more than 100 countries. It's time to change the approach! Danfoss already has the proven technologies to make hotels efficient, by managing heating, cooling and ventilation and control everything that's happening inside a hotel in terms of its environment. 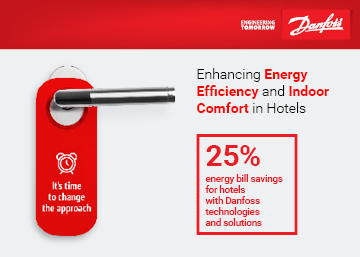 Danfoss solutions make hotels performance remarkable – proactively managing energy usage and maintaining a healthy, comfortable and productive living environment. With advanced technologies that enable engineers to build a better, smarter and more efficient tomorrow, we ensure the supply of fresh food and optimal comfort in our homes and offices, while meeting the need for energy efficient infrastructure, connected systems and integrated renewable energy. Our solutions are used in areas such as refrigeration, air conditioning, heating, and industrial automation.